Why do people who are more socially connected live longer and have better health than those who are socially isolated? Why are social ties at least as good for your health as not smoking, having a good diet, and taking regular exercise? Why is treatment more effective when there is an alliance between therapist and client? Until now, researchers and practitioners have lacked a strong theoretical foundation for answering such questions. This ground-breaking book fills this gap by showing how social identity processes are key to understanding and effectively managing a broad range of health-related problems. 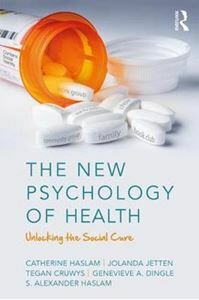 Integrating a wealth of evidence that the authors and colleagues around the world have built up over the last decade, The New Psychology of Health provides a powerful framework for reconceptualising the psychological dimensions of a range of conditions - including stress, trauma, ageing, depression, addiction, eating behaviour, brain injury, and pain. Alongside reviews of current approaches to these various issues, each chapter provides an in-depth analysis of the ways in which theory and practice can be enriched by attention to social identity processes. Here the authors show not only how an array of social and structural factors shape health outcomes through their impact on group life, but also how this analysis can be harnessed to promote the delivery of `social cures' in a range of fields. This is a must-have volume for service providers, practitioners, students, and researchers working in a wide range of disciplines and fields, and will also be essential reading for anyone whose goal it is to improve the health and well-being of people and communities in their care.